GREEN OIL JAPAN, a declaration promoting Japan toward a biofuel advanced nation. euglena Co., Ltd. (headquartered in Minato-ku, Tokyo; Mitsuru Izumo, CEO; “euglena Co.”) is pleased to announce that the company completed the construction of Japan’s first demonstration plant for producing renewable jet and diesel fuel in Tsurumi, Yokohama (“the demonstration plant”) on October 31, 2018. With the cooperation of the City of Yokohama, Chiyoda Corporation (“Chiyoda”), Itochu Enex Co., Ltd. (“Itochu Enex”), Isuzu Motors Limited (“Isuzu”), ANA Holdings Inc. (“ANA”), and Hiroshima Council for the Promotion of Collaboration between Government, Academia and the Automobile Industry (“Hirojiren”), euglena Co. will lead Japan with its new declaration GREEN OIL JAPAN on its path toward becoming a biofuel advanced nation, following the United Nation’s GOAL13, “take urgent action to combat climate change and its impact,” one of the Sustainable Development Goals, SDGs*1. In addition to this SDGs’ GOAL13, set at the United Nation’s summit in September 2015, the Paris Agreement on climate change, was agreed at the Paris climate conference in December, 2015 and Japan set the target to reduce emission of greenhouse gas, mainly CO2, by 26% from the emission level in 2013. At the general meeting of the International Civil Aviation Organization (ICAO), held in 2016, the member countries, including Japan, agreed not to increase CO2 emissions after 2020. Revenue flights, using renewable jet fuel, are regarded as promising measures, and underway in the U.S., major EU countries, Canada, Australia and Asian countries, including Singapore, Thailand, China and India. Japan has not implemented a revenue flight, using renewable jet fuel and is urged to follow those countries, deploying such fuel. Although the target for using biofuel for automobiles among all the transportation fuels is 18% in the U.S. by 2022*2 and 10% in EU countries by 2020*3, in Japan, the target for deploying biofuel as an alternative to gasoline and diesel fuel is as low as several percent per year by 2022*4. In such circumstances, on December 1, 2015, euglena Co. announced a plan to produce and supply renewable jet and diesel fuel in Japan for practical use in commercial aviation and public road transportation by 2020 (Made-in-Japan Biofuel Project), with support from the City of Yokohama, Chiyoda, Itochu Enex, Isuzu and ANA. On June 1, 2017, we began construction of Japan’s first demonstration plant for producing and supplying renewable jet and diesel fuel, and completed the work on October 31, 2018. The demonstration plant will begin full-scale operation in spring 2019 and begin producing renewable jet and diesel fuel using Euglena, microalgae and waste cooking oil as raw materials. 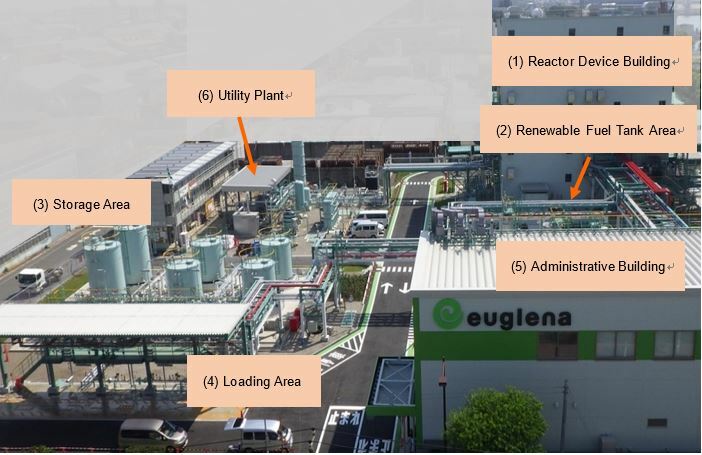 euglena Co. started the plan to achieve a revenue flight using renewable jet fuel, produced at the recently completed demonstration plant in Japan, by 2020, and to supply next-generation renewable diesel fuel*5 produced at the demonstration plant in summer 2019.
euglena Co. also conducted the emission tests using the next-generation renewable diesel fuel produced from the same raw materials and production method as the demonstration plant, as part of the study on the practical use of next-generation renewable diesel fuel, that we have been working on with Isuzu since June 2014. We verified that the fuel with a content rate of 100%*6 can be used in the current vehicle engine*7. In response, Isuzu will start demonstration testing by using a fuel containing the next-generation renewable diesel fuel for the shuttle bus operation between Isuzu Fujisawa Factory and Shonandai Station in December 2018. Under the declaration of GREEN OIL JAPAN, we are working to ensure that renewable fuel, produced in our demonstration plant, are introduced to land, sea and air transportation by 2020. By 2030 we aim to expand supporters using and producing renewable fuel across the nation, and to establish biofuel business as an industry. To this end, we are looking to develop a commercial-scale plant with the production capacity of 250,000KL/year renewable fuels per year by 2025, targeting to produce renewable fuels at JPY100/L. We further aim to supply 1 million KL/year renewable fuels by 2030. We invite companies and organization who support the GREEN OIL JAPAN and cooperate with us in conducting and supporting the use of renewable fuel, supply of raw materials, and spread of renewable fuel (http://euglena.jp/greenoiljapan). *2: The US target for biofuel usage is 36 billion gallons by 2022, which is approximately 20% of the total transportation fuel in US, according to our estimate. *4: Status of Consideration of Notification on Sophistication Related to the Deployment of Renewable Fuels, Agency for Natural Resources and Energy. *5: Next-generation renewable diesel: A renewable diesel fuel with a content rate of 100% that can be used with no negative effect on the vehicle engine. *6: Additives, also used for fossil fuel, are excluded. *7: As the initial performance was confirmed. The effect on a durability of engine will be tested by demonstration drive. Products: Renewable jet fuel, next generation renewable diesel fuel, renewable naphtha, etc. （1）Reactor Device Building: The facilities to produce renewable jet and diesel fuel from raw materials (Euglena fats and oils). （2）Renewable Fuel Tank Area: The area to store produced renewable jet and diesel fuel. （3）Storage Area: The area to store renewable jet and diesel fuel after mixing petroleum fuel to each type. （4）Loading Area: The facilities to ship completed renewable fuel to users. （6）Utility Plant: The facilities for supplying steam, compressed air, etc. to the demonstration plant. With the goal of “promoting Japan toward a biofuel advanced nation”, this declaration GREEN OIL JAPAN, we aim at producing and supplying renewable fuel for practical and widespread use in Japan. 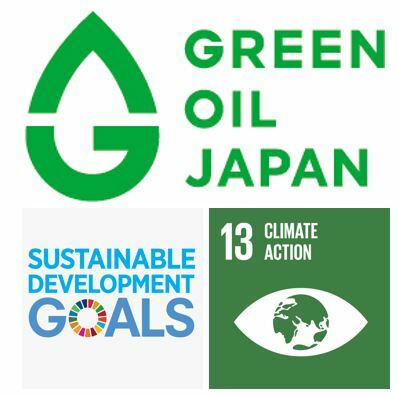 We believe that our approach to GREEN OIL JAPAN corresponds to “GOAL13: Take urgent action to combat climate change and its impact” in SDGs. We seek all companies and organizations (transportation and shipping industry, food industry, local governments, etc.) who support the GREEN OIL JAPAN to join us in developing renewable fuels in Japan, by supplying raw materials and spreading renewable fuels use across the countries. ■ Renewable fuel produced by euglena Co.
Renewable fuel is liquid fuel that emits less CO2 compared to existing fossil fuel theoretically and are widely used around the world, mainly in the U.S. and Europe. Meanwhile, conventional biofuel, which is produced by crops, such as corn, sugar cane, soybean and palm trees as main raw materials, is feared to cause competition with the food supply and an increase in greenhouse gas emissions as a result of deforestation. Renewable jet and diesel fuel produced by euglena Co, which uses Euglena fats and oils and waste cooking oils as the main raw materials, are expected to become sustainable fuel that will not cause such problems as competing with the food supply and deforestation. In addition, they can be applied to existing engines that use fossil fuel without any problems and do not require the large cost to establish infrastructure needed for a transition to alternative energy sources, such as hydrogen and electricity. For these reasons, use of our renewable jet and diesel fuel may increase while efficiently spreading in the present-day society where a large amount of petroleum is used, and maintaining the existing infrastructure. euglena Co. listed on the first section of Tokyo Stock Exchange (Ticker: 2931), is the first biotechnology venture company in the world that succeeded in outdoor mass cultivation of microalgae “Euglena” in 2005. We currently operate a Healthcare Business for marketing “Euglena” functional foods/cosmetics and an Energy & Environment Business promoting R&D for biofuel production.